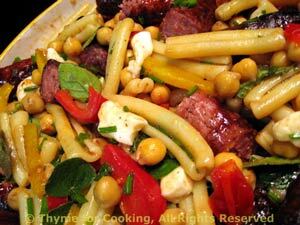 Pasta Salad with Sausages and Chickpeas, Weekly Menu Planner. Grilled sausages lend a nice flavor to pasta salads but you can fry them in a skillet if you prefer. This salad can be served warm, room temperature or chilled.